What makes the Gold Coast Australia’s most exciting holiday playground? Over in “Goldie” it’s never too hot or too cold, and the easygoing vibes are always just right. They don't call it golden for nothing—this collection of villages can totally brag about more than 70km of gorgeous coastline. Is it really bragging if it’s true, though? 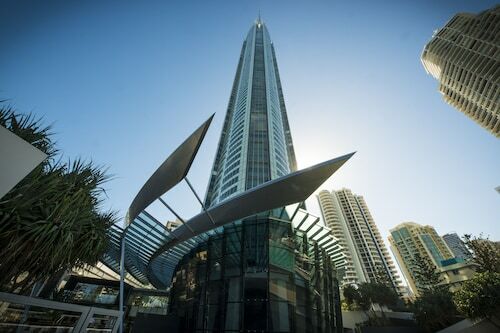 Whether you’re itching for a great view from the top of the SkyPoint Observation Deck, planning a dip in the bright blue waters at Main Beach or looking forward to the cool club scene in Surfers Paradise, you’ll find the best places to stay in Gold Coast right here with Wotif. 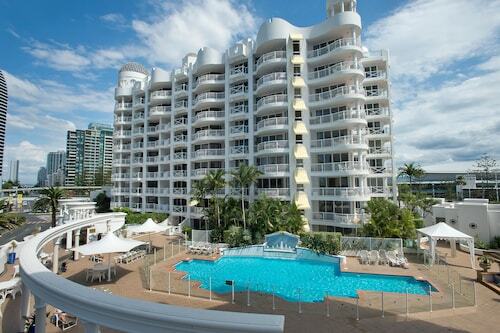 You know you want accommodation in Gold Coast. The only question is which beachy, laid-back area is right for you. Much like the Wahlbergs, they might all be in the same group, but they’ve got distinct personalities, thank you very much. 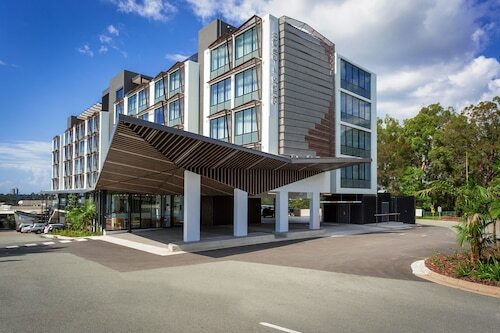 Speaking of celebrities, hotels in Gold Coast are no stranger to them. Celeb-spotting is a bona fide hobby around here, and while you won’t find the Wahlbergs—at least none that we know of—there are plenty of other stars, studs and star-studded spots. Matthew McConaughey, Pink, Bono and Beyoncé have all been spotted here. Umm, what about Hugh Jackman, you ask? Make the trip out to Gwinganna Lifestyle Retreat in the hinterlands and you just might dine next to him. He co-owns it! Gold Coast doesn’t just attract celebrities from afar. It’s produced champions of its own, including Olympian Sally Pearson, tennis star Samantha Stosur and actress Margot Robbie. Celebrities plus chefs equals…celebrity chefs! Award winner, cookbook author and spice seller Luke Mangan’s Salt Grill is located in Surfers Paradise. Pair the degustation menu with a boutique vintage, pretend you know what those words mean, and you’ll be living like a celebrity yourself. Got rugrats in tow? See a different kind of star at Movie World, where you can find your favourite cartoon characters on the Star Parade. And unlike the one in Hollywood, you just might be able to take a pic with them, too. Dreamworld Park is appropriately named: all sorts of dreams come true here. Ride white water rapids, visit with tigers and head to a silent disco at Screamworld (no screaming, please). You can let out those shrieks on the Big 8 Thrill Rides, which have names like The Claw and The Buzzsaw. Fun! When the weather heats up, Wet N Wild will cool you off. They have the standards like a wave pool and lazy river, but we think that’s borrrringgg. Get the adrenaline pumping on the Extreme H20 slides: Black Hole, Kamikaze, Mach 5 and Tornado. Bring an extra suit in case of…accidents. There’s surfing basically everywhere in Gold Coast, but there’s only one neighbourhood that has “surf” in its name. 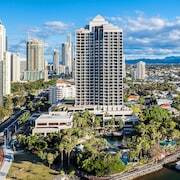 Surfers Paradise Marriott Resort & Spa puts this famous region at your fingertips—not to mention uber-comfy pillow-top mattresses at your toe tips. Take it all in from your floor-to-ceiling windows and use that free Wi-Fi to plan your day. Surf’s up in Surfers Paradise…what kind is up to you. Get a new perspective from the top of the SkyPoint Observation Deck, where you can gaze out at the hinterlands and beyond from 230m up. Hit the Surfers Paradise Beachfront Markets on Wednesday, Friday and Sunday nights to get your quirky fix. Old comics, snake-shaped bottle openers and cane toad leather goods—yes, that’s a thing. And now you own a cane toad purse. Lay on the beach all day soaking up the sun and not moving a muscle, or catch some waves out on the breaks. Yeah, this will probably be the suggestion you go with. Here’s another place where it’s all in the name: Main Beach. Yep, this is the main beach, so called because of its proximity to the CBD (which is actually Southport, not Surfers Paradise). You could even say Palazzo Versace is in the main part of Main Beach! These days, the main activity here is chilling out. Dine al fresco (that means “at a leisurely pace” …just kidding, it means outside) at Southport Surf Club Restaurant, then hit the beach. Things heating up? Find a shady patch of grass in Hollindale Park or frolic in the waves. Beach, park, water, repeat. 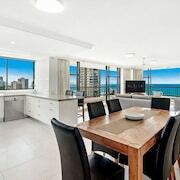 Now you’re getting the hang of the Gold Coast life. 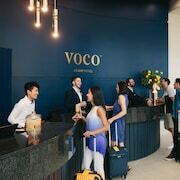 If all that dough you saved with our Gold Coast hotel deals is burning a hole in your pocket, the shops and restaurants along Tedder Avenue can take care of that for you, no problem. 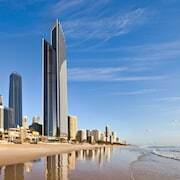 To the south, Peppers Broadbeach will introduce you to lively “Broadie”. After you enjoy your ocean view and check out the pillow menu, you’ll be ready to take it from there. Broadie is sort of like your directionless little brother who finally decided to become a chef and dress nice. And we mean that literally—this is the place to be for food and shopping. The Broadbeach Mall isn’t one of those air-conditioned, steel contraptions; it’s a pedestrian-only area filled with street artists, patio dining and plenty of character. You can travel the world without even leaving the area between Charles and Elizabeth Avenues. Cuban, Middle Eastern, Italian, Japanese and German can all be found here. Label hounds can find the Gold Coast’s best upscale shopping at Pacific Fair. Say hello to all your favourite brands, and work off that food carrying those bags back to your Gold Coast accommodation. If famous people, awesome theme parks, beautiful beaches and tons of shopping and dining aren’t enough to convince you, we don’t know what is! Come see why the Gold Coast really does deserve the gold medal—in holidaymaking. Mix and match your hotel and airfares to create your dream getaway with Wotif’s Gold Coast holiday packages, and we’ll see you on the beach! 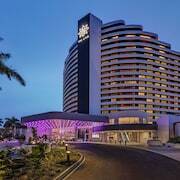 How Much is a Hotel Room in Gold Coast? 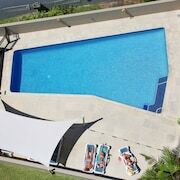 Hotels in Gold Coast start at AU$88 per night. Prices and availability subject to change. Additional terms may apply.